I have been working on the Rainbow Scrap Challenge 2013 this past week. We are using our Orange scraps for the month of March. 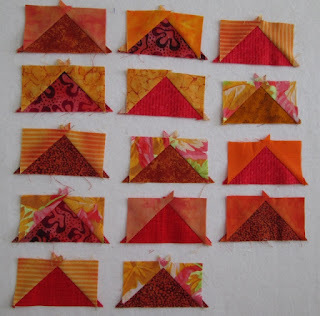 To see what other quilters are doing with orange scraps go take a look at Soscrappy. I first have my sprout blocks done. So far I have been doing five of each of the colours. I am not sure how big this quilt will be or how many blocks I will make. You can find the pattern for the Sprout block. I did some flying geese this week. They measure 2" by 3 1/2" and will finish to 1 1/2" by 3" when sewn in. I think I could always use some on a boarder or to joint blocks together. We will just see what comes. We did Orange last Sept 2012, so I have already done many spools. I found two more orange fabrics to do. I am trying to do the spool quilt like a charm quilt were the fabrics are not repeated. I have a dog trial on Sunday. Wish us luck. I hope the roads are not to bad in the morning. We have blowing snow here and there. I love what you've been doing. 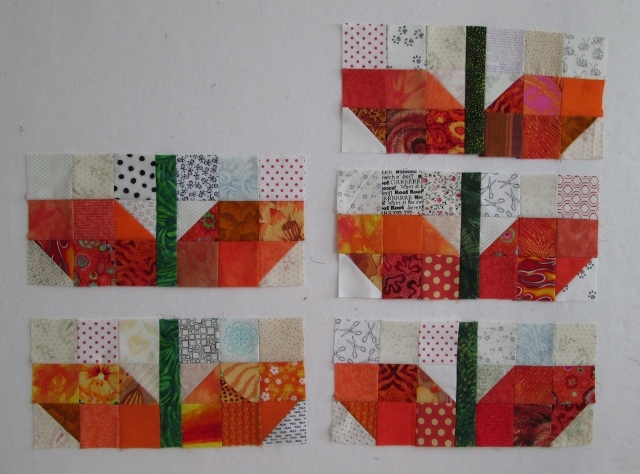 I just finished a small quilt with some of my orange blocks from last year. Wow, I think you got a lot of orange blocks done, still loving those sprouts. Good luck tomorrow with the dog trial! I love your orange blocks!! Love the sprouts - makes me think of spring and we really need it to arrive soon. We are getting flurries this morning. Travel safely to those dog trials, Cathy! Up here in the east end of Edmonton where I'm visiting my daughter, it's still snowing. Good luck at the trial today! Love your sprouts and spools...hey...that's a great quilt title! I am looking forward to seeing how your sprouts look in a quilt. They do look lovely. 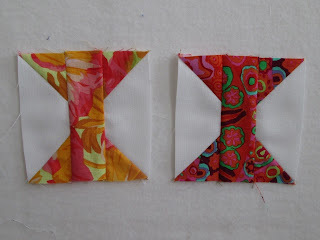 A great idea to sew up some blocks like the flying geese to use in a border or sashing. I must make some more blocks for last years challenge too. Good luck at the dog trial today. Wow. I love your orange blocks, Cathy. Great bunch of orange blocks. Hope you did well at the trial today. Looking good! Can't wait to see what you make with them all. Love those sprouts and spools. Trusting that you and Lex had a great day yesterday.